1. Put butter in a saucepot. How many sticks depends on how much clarified butter you want. 2. Slowly bring to simmer. 4. Some milk solids will rise to the top. Skim those with a spoon and discard. 5. Pour oil through a chinoise or strainer, leaving the solids behind. The oil is the clarified butter. 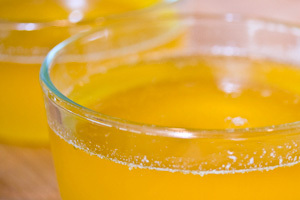 Clarified butter keeps well in the refrigerator for at least as long as regular butter. 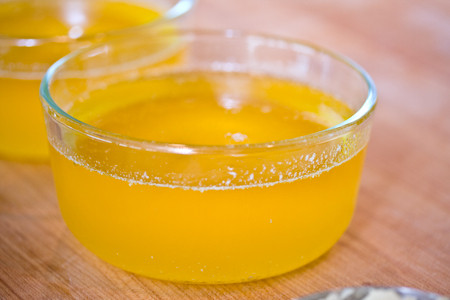 Clarified butter is great for high-temp cooking. On the other end of the temperature range, truffle oil loses much of its flavor when added to heat. So, use truffle oil as a finishing oil. Great blog! Sorry I missed your comfort food contest. Your comment got marked as SPAM and I just saw it when I was cleaning up that folder. Bummer!! Also, I love clarified butter.